You like to gamble or be suprised? We'll be sending you 10 LP's or 10 inches for just € 39,- (+ shipping). We'll make sure that you get 10 different LP's. 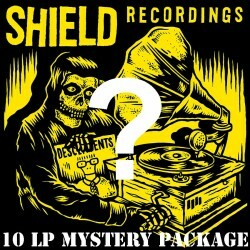 Mostly these will be Shield Recordings releases, but also distro stock and we might put in a testpress here and there! (Shield Releases from 2005 up to 2016). If you allready have one (or more) of our releases, put it in the comments and we'll try to get you 10 other records!